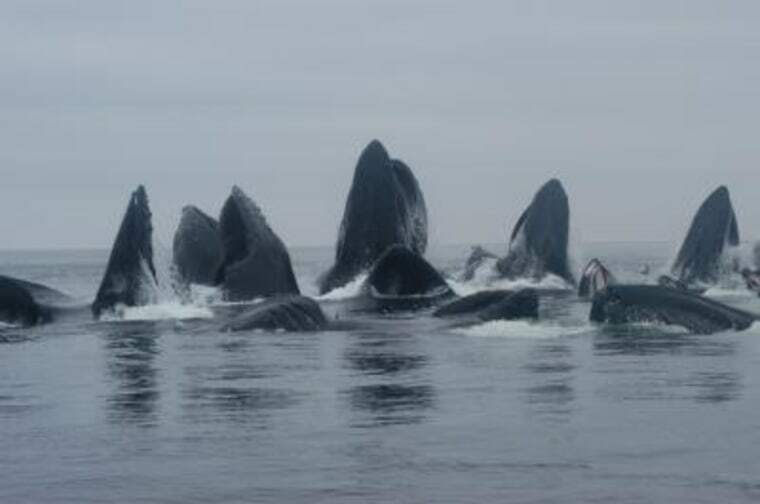 Humpback whales are found throughout the world's oceans. In the North Pacific, they number more than 21,000 today, up from less than 1,000 at the end of commercial humpback whaling in 1966. "That is a great thing," Scott Baker, a marine biologist with Oregon State University's Hatfield Marine Science Center in Newport, told NBC News. In fact, those numbers suggest a return to pre-whaling robustness, a success story that has prompted the federal government to consider removing the North Pacific humpback population from protection under the Endangered Species Act. The "but," noted Baker, is that the new research suggests the North Pacific humpbacks should not be treated as single group, but rather managed as five individual populations with distinct breeding and feeding grounds. "It is not a single intermingling population across the North Pacific," he said, adding that "there are quite profound, significant differences" between the populations. The finding is based on DNA analysis of nearly 2,200 tissue samples taken from whales over the course of three years throughout their known range in the North Pacific, as well as identification of individual whales via photographs. "The power of the genetic tools is you can look for differences between these populations that reflect long-term historical traditions," Baker explained. That data show that the humpbacks have "very strong fidelity to migratory destinations." That is, even though the whales could swim anywhere in the ocean, they faithfully swim between the same winter breeding and summer feeding grounds year after year. The researchers think this stems from the early life of the whales. Young whales complete one annual migration with their mothers before they are weaned. "They learn a migratory tradition," Baker said. The caveat it is that some populations overlap in their summer feeding grounds, particularly in Alaska and, occasionally, a whale that normally winters in Mexico may return to Hawaii for a winter to breed, a tactic thought to increase genetic fitness. Such mixing, however, "is not sufficient to create a single, interbreeding population," Baker said. The historical threat to humpback whales was hunting. The International Whaling Commission prohibited commercial whaling of humpbacks in 1966. The intergovernmental body banned all commercial whaling in 1986, though Iceland, Norway and Japan continue to whale, often claiming for scientific research. Today, the biggest threats to humpback whales come from entanglement in fishing gear set out for other species, collisions with ships, and general environmental degradation from activities such as oil tankers in Alaska's Prince William Sound, Baker said. As well, humpbacks in the western North Pacific continue to show up for sale in markets in Japan and Korea, noted Baker. He said they are either hunted illegally, or killed when entangled in fishing nets. His hope is the new research indicating these populations are distinct will inform conservation managers to treat them individually. "These are complex populations," Baker said. "They have complex histories. They have complex distributions and maybe we need, perhaps, reasonably complex management systems." The findings were published this week in the journal Marine Ecology – Progress Series.